So this is what we thought the internet looked like back in 2010. Apparently not too much has changed – other than it’s worth noting that when this video was originally created,there was barely any Little Big Planet machinima, despite its excellent puppet-style controls. This was created by Canned Geek co-creator Will Owen waaaaay back. ”Bring us the girl and wipe away the debt.” Sounds simple right? Yet Bioshock Infinite is a game that relishes in subverting expectations. What begins in a rescue the princess style mission unravels into a complex and affecting experience. Anyone who has read TV Tropes will know that the most interesting examples are where a trope is subverted. In this article we’ll examine how Elizabeth sets up and flips over our expectations for both damsels in distress and for AI companions in video games. Read only if you’ve finished Bioshock Infinte – spoilers ahead. The damsel in distress trope is tenacious, having lasted for centuries and is found throughout all mediums; from tales of dragon slaying and princess rescuing through to King Kong and beyond. Video games often use a kidnapped woman (often a lover or potential or implied lover) as a launchpad for the narrative and end goal for the gameplay. From Mario to Dishonoured, damsels are everywhere. The problem is that these characters can sometimes by little more than a human trophy; lacking their own personality or power. Likewise AI companions can be problematic; often hindering more than helping. They may step in front of bullets, wander off and get killed and fail the mission for you. There are some notable exceptions, such as Uncharted and Ratchet & Clank – both of which primarily use cutscenes and the occasional buddy mechanics to make them a useful ally. From Mario to Dishonoured, damsels are everywhere. Elizabeth of Bioshock Infinite is a damsel in distress who then becomes an AI companion…which on paper sounds awful. Where Bioshock Ininfite succeeds is by having Elizabeth integrated into both the narrative *and* the gameplay to an unprecedented degree. But before breaking the formula, the game first sets up and plays to our expectations. We raised $895.55 for Child’s Play with just 50 people. Thanks for coming – it was an experience. Since 2007 Canned Geek has been the comprehensive guide to every event across Australia and New Zealand – and we felt it was about time we ran an event of our own. Oh Hi Doggie is a charity film screening of the cult classic The Room to raise funds for Child’s Play – a charity organisation which distributes toys and video games to children in hospitals worldwide. Sometimes charity means sacrifice. Other times charity means sitting through and laughing at a bad movie. Note that since The Room is a mature film, attendance is restricted for people aged 18 or over. Attendees under the age of 18 will not be granted entry. Child’s Play is an American based charity which helps sick children in hospitals by distributing much needed toys and video games to a network over 70 hospitals worldwide. “It’s hard for kids to cope with hospitalisation,” explains Lina Lewis of the Seattle Children’s Hospital. By engaging them through play and distraction, children are better able to deal with a hospital environment, request less pain medication and are more compliant with medical procedures. Penny Arcade co-creator Jerry Holkins further explains: “Playing video games provides a line of continuity between living at home and living at the hospital.” It can be a scary time for both children and parents. Since starting in 2003 the charity has raised millions and has had a profound and substantial impact in helping children through their time in hospital. Since its release in 2003, The Room has been regarded as one of the worst films of all time. Written, directed and starring Tommy Wiseau, it tells the story of a man whose relationships crumble around him. It also has absolutely nothing to do with Child’s Play. It has, however, gained a massive cult following and is considered by many to be the prime example of ‘so bad it’s good.’ The Melbourne screening has the potential to raise thousands of dollars for Child’s Play and it’s our hope that The Room will draw people in. Spoons will be provided at the door. The short version of this review is that if you like to go to music concerts then spending $30 on a pair of Etymotic ER-20 earplugs is the best investment you can ever make. It used to be that every time a loud concert or gig finished and I exited the venue and stepped out on the street I immediately became aware of a constant high pitched ringing in my ears. During the gig with the music blaring there was no ringing – but once I was in the quiet environment outside the ringing would begin and would persist until the next morning. This high pitched sound wasn’t just an annoyance, but a likely sign of damage being done to my ears due to the excessive volumes. But then last year, as I was about to go to a Napalm Death show of all things (Napalm Death are the founders of the grindcore genre and are very harsh sounding and very loud) I took along a pair of those cheap foam earplugs. Wearing them made for a muffled listening experience, so I kept taking the foam earplugs in and out every so often through the show – yet despite only wearing the earplugs half the time, when I walked outside covered in sweat (only some of it my own) I found there was absolutely no ringing in my ears. As was already discussed on this podcast, I wasn’t too impressed by Grand Theft Auto IV. I’ve played most of the Grand Theft Auto games since Grand Theft Auto 2 on the PC and enjoyed seeing the constant advancement of the core gameplay mechanics. This peaked with Grand Theft Auto: San Andreas on the PlayStation 2. In that game freedom and fun reigned supreme and it was just as enjoyable to play as it was to sit with a friend and see what they would do. It might be that an epic police chase that started with accidentally running over a pedestrian and then was taken out of the city, through forest and desert until it ended with your fighter jet being shot out of the sky. The scope of the fun in that game was magnificent.But this article isn’t about comparing San Andreas and Grand Theft Auto IV. 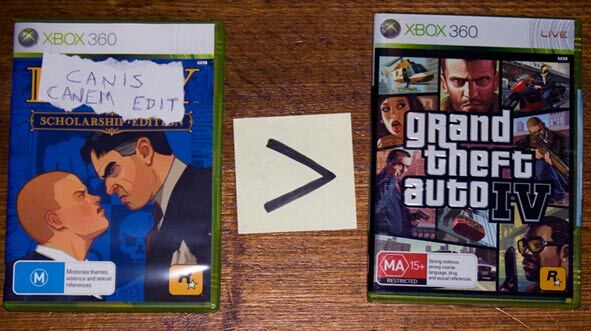 It’s about comparing another Rockstar game, Canis Canem Edit with Grand Theft Auto IV. Did you ever see Disney’s Hercules? You might want to see it again sometime because I’m about to give you a new perspective on it. I’m also about to talk a lot about the story – so consider yourself warned if you haven’t seen the film yet and don’t want to hear any spoilers.Hit the jump to read on as I dissect the film and reveal the true tragedy in the story of Disney’s Hercules.Hercules is a solid animated feature that has its roots in Greek mythology, but tweaks the story a bit. In Disney’s telling Hercules is the son of Zeus (ruler of the gods and Mount Olympus) and Hera who are just thrilled to be parents. Less thrilled is Hades, Zeus’s brother and Lord of the Underworld. Already bitter about past disputes with Zeus (which are only hinted at), Hades is particularly riled that the Fates have prophesised that Hades plans to overthrow Zeus will be thwarted by Hercules. So Hades orders his two minions Pain and Panic to steal baby Hercules from Mount Olympus and kill him. They manage to fly in, steal Hercules and take him down to Earth – realm of the mortals. Once on the ground they feed him a potion to make him mortal with the intent to kill him once Hercules is mortal. But they fail for two reasons. Firstly, they’re startled by the approach of two peasants – a husband and wife – and they drop the potion bottle just before Hercules drinks the last drop. Because of this Hercules was turned mortal, but retained his Godly strength and was able to fight off the two demons. But being mortal, baby Hercules could not return to Mount Olympus and is adopted and raised by the peasant couple while Zeus and Hera can only look down at their son from the sky. So that’s the first part of the story. From here on the story centres on Hercules, who faces many obstacles and must eventually thwart Hades and save Meg, the woman he falls in love with. Yet for all that Hercules goes through – both physical and mental – I argue that the characters who suffer the most hardship in the entire film are Hercules parents, Zeus and Hera. Over on The Morning News, Joshua Allen has written this humorous and eloquent article on the perfect song length. The crux of his point is that song writing should be to the point – conveying what it needs to and avoiding the superfluous. He makes a good case for his argument, backing up the ideal running time of 2 minutes and 42 seconds with such examples as The Beatles’ Lovely Rita and California Dreamin’ by Mama and the Papas. So I booted up iTunes and decided to take a look through my own playlist and see whether my own music collection supports Joshua’s theory. Rowling kicks Dumbledore out of the Closet. Also, a Rant. During her first U.S tour in seven years J.K Rowling, author of the popular Harry Potter series (like you didn’t know already), has told her fans that she “always thought of Dumbledore was gay”. Confirming what quite a few fans already suspected.Rowling went on to fill in some of Dumbledore’s back-story. Telling the audience that he had fallen in love with the charming wizard Gellert Grindewald. However he was into the dark arts so Dumbledore had to destroy him. Rowling called it Dumbledore’s “great tragedy”.